As a youth sports volunteer, you should get used to wearing many hats, for you’ll be not just a coach, but also a teacher, friend, and confidant. Coaching can be rewarding, but if you venture into the season unprepared, the role can be a frustrating one. Enter Your First Coaching Book. Created by The National Alliance For Youth Sports, it provides valuable tips on how to encourage fun and good sportsmanship, maximize basic skill development, deal with inappropriate behavior from players and parents, and prevent injuries by maintaining high safety standards. Whether you’re a first-year coach or a seasoned veteran, the children on your team will remember you and their sports experience for the rest of their lives. Your First Coaching Book will help ensure that these memories are happy ones. The National Alliance For Youth Sports is America’s leading advocate for positive and safe sports for children. The Alliance features a wide range of programs that educate volunteer coaches, parents, youth sport program administrators, and officials about their roles and responsibilities in the context of youth sports. The Alliance’s programs are provided at the local level through dynamic partnerships with more than 2,400 community-based organizations. There are few things in life more rewarding than coaching a youth sports team. It doesn’t matter if you’ve stepped forward because you want to be actively involved with your son or daughter this season, or if you were somehow persuaded by the innocent-looking woman at the registration desk, who pleaded that the league was in desperate need of coaches and that you’d be perfect. Regardless of why you volunteered, one thing is certain—you are about to embark on a wonderful journey filled with special moments that you will carry forever. You’ll be there to congratulate your young players when they get their first hit or grab a game-winning touchdown pass. You’ll also be the one to console them and bolster their spirits when they miss the crucial free throw that could have won the game. You’ll emphasize good sportsmanship and playing by the rules. You’ll preach the merits of teamwork, effort, and commitment. They’ll call you “Coach,” but you’ll be so much more. You’ll be a teacher, role model, friend, confidant, disciplinarian, and the mother or father figure for some. It will be an amazing experience, but not necessarily an easy one. After all, you will have a group of youngsters under your supervision for an entire season. You’ll also have their parents, grandparents, friends, and neighbors, who will be watching, examining, and dissecting your every move. You’ll probably see your fair share of win-at-all-costs coaches who are intent on proving that their team is better than yours, and that they’re better than you, even if it is a T-ball league of five-year olds who aren’t any bigger than the bats they’re swinging. Yes, youth sports can be a pretty intriguing mixture of experiences. If you venture into the season unprepared, the role of coach can be a frustrating one. Enter Your First Coaching Book. Designed specifically for the volunteer coach, this handy resource will help you deal with a variety of issues you are likely to face at some point during the season. Part of a series of books developed by the National Alliance For Youth Sports—America’s leading advocate for positive and safe sports for children—this book offers lots of helpful tips and useful advice to help ensure a fun-filled season for you, the parents, and most important, the youngsters on your team. It doesn’t matter if you’re coaching a six-year-old girls soccer team or a group of fifteen-year-old football players. In either case, you’re likely to face a variety of challenges, and this book extends a hand to help you deal with them. You’ll learn how to effectively communicate with youngsters who have vastly different personalities, backgrounds, talents, and skill levels, and mold them into a cohesive, spirited team. You’ll discover how to design effective practices that encourage your players to develop basic skills while boosting their self-esteem. You’ll also learn valuable methods for dealing with meddling parents and volatile coaches, as well as children with short attention spans and bad attitudes.You’ll ­recognize and understand the challenges that many coaches encounter, and gain confidence in knowing how to handle them. Regardless if you’re a first-year coach or a veteran who has taken countless post-game trips to the local ice cream ­parlor, coaching young children is drastically different from coaching on the high school, college, or professional level. How you handle the youngsters on your team and the way you interact with them at practices and games will have an enormous impact on whether or not they embrace the sport. Reflect on your own experience. You’ll probably remember the names of most of your coaches, and whether or not your experience was fun. A coach’s influence can have a lasting impression on children. Keep this thought in mind each time you step onto a field, court, or rink with your players. The kids on your team will be putting their trust in you. They’ll count on you to guide, teach, and motivate them. They’ll be looking to you for a smile and a high-five when they do something well, and a pat on the back or a word of encouragement when things don’t go their way. These children are going to remember you for the rest of their lives, and the experiences they have with you will be forever etched into their memories. 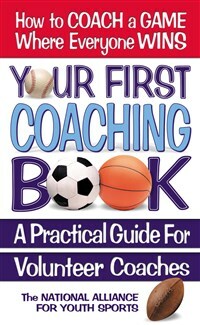 Your First Coaching Book is a valuable resource to ensure that their memories are happy ones.